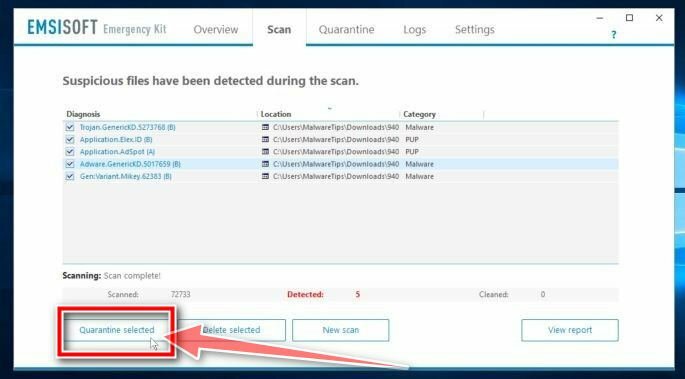 Emsisoft Emergency Kit is a free and powerful on-demand scanner that can be used to remove viruses, trojans, spyware, adware, worms, and other malicious programs. This scanner contains the same functionality as the Emergency Kit Scanner but without a graphical user interface. The command line tool is made for professional users and is perfect for batch jobs. Emsisoft Emergency Kit is designed to work alongside existing security programs without any conflicts. It scans the computer quickly and does not slow down the computer (except for the few minutes it is scanning). 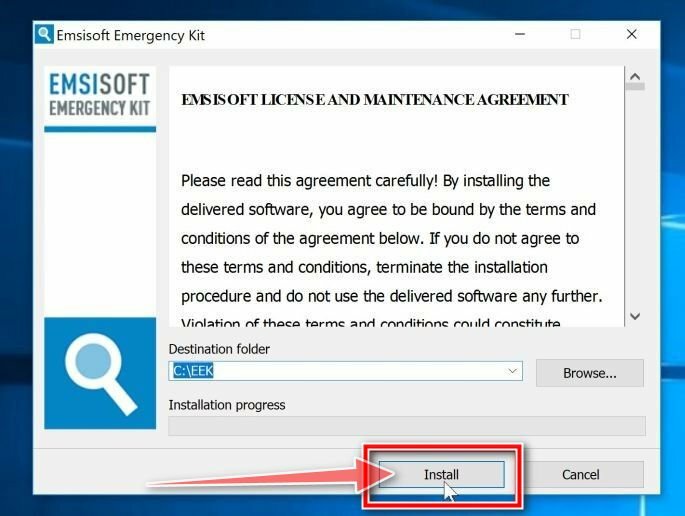 Emsisoft Emergency Kit does not need to be installed. It can be run straight from a USB flash drive, a CD/DVD, local or network attached hard drive. You can download Emsisoft Emergency Kit by clicking the link below. Double-click on the EmsisoftEmergencyKit setup file to start the installation process, then click on the “Install” button. On your desktop the “EEK” folder (C:\EEK) should now be open. 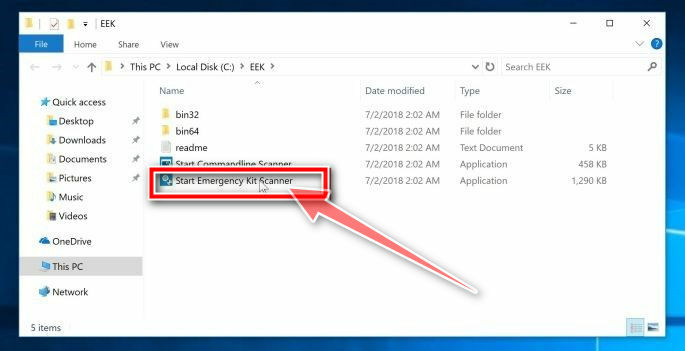 To start Emsisoft, click on the “Start Emsisoft Emergency Kit” file to open this program. 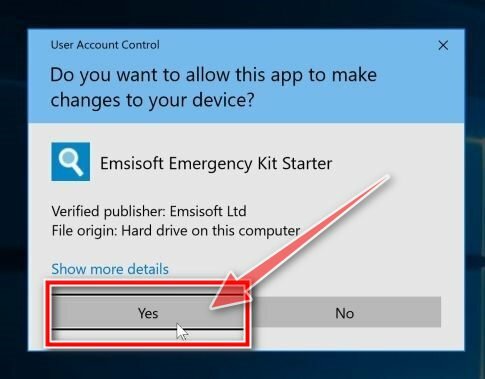 Emsisoft Emergency Kit will start and it will ask you for permission to update itself. 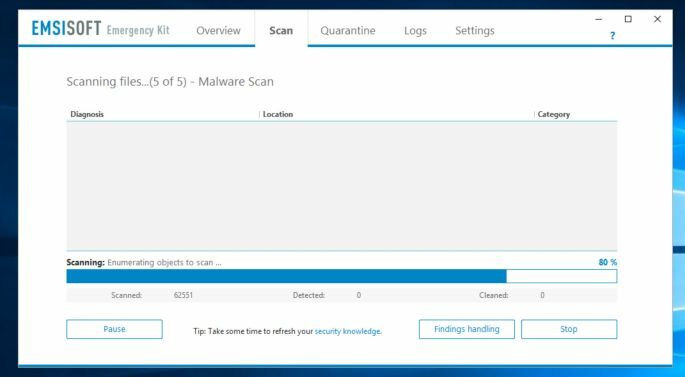 Once the update process is complete, click on the “Scan” tab, and perform a “Malware Scan“. 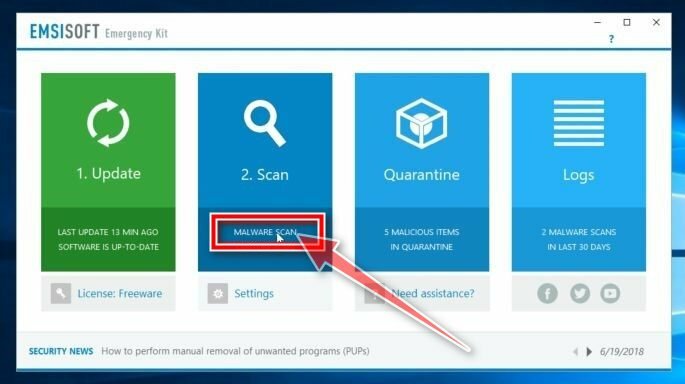 Emsisoft Emergency Kit will now scan your PC for malicious files. This process can take a few minutes. When the Emsisoft scan has finished, you will be presented with a screen reporting which malicious files were detected on your computer. To remove the malicious programs, click on the “Quarantine selected“. When the malware removal process is complete, Emsisoft Emergency Kit may need to restart your computer. Click on the “Reebot” button to restart your PC.